just in time for the festive season, Forestidia and I present xmas2018! 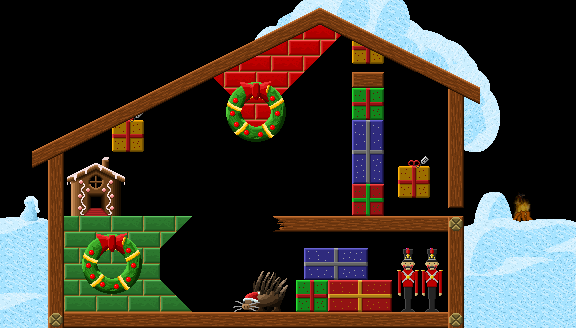 This is a holiday-themed singleplayer pack for Lix with 24 levels, including one by Raymanni. Get it: Download newest version of Lix, xmas2018 has been included since Lix version 0.9.22. Look in the folder levels/single/misc/. Ideas behind the pack: This season is about love and caring. You don't have to implode, cube, or kill lix: In these levels, all lix must be saved. The 24 levels stand for the 24 days until Christmas. You can play one level per day, or try to solve them all in a single sitting. It's your choice. Have some hot chocoloate and enjoy the pack! The first level of the pack. 24 little doors with 24 little surprises. Join us in the homely living room. 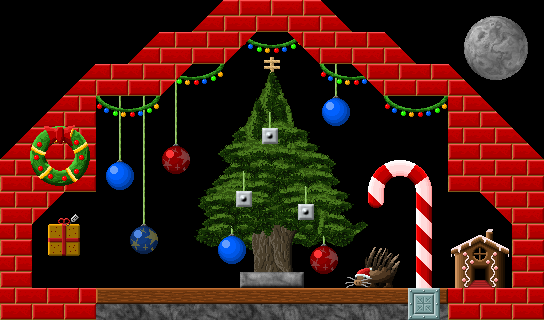 The holiday porcupine can't wait to see your newest tree stylings. Santa has delivered all the presents. The cookies were tasty. Let's help him leave the house through the chimney. Join the expedition to Santa's home in the icy north. Earlier, you've guided the Three Wise (Wo)Men through the desert. Now they must agree where to meet in the shed. I will definitely be playing one per day so I'll comment on the levels later. Impressive, Simon! I haven't seen anyone "painting" with level tiles in Lix so far, only in NeoLemmix. I'll probably stream a playthrough tomorrow around 16:30 UTC (2.5 hours before the multiplayer session) and see how far I get. Had to make a new twitch account because my old one apparently got deleted for no reason. I think I still found a few little backroutes. Btw: The update zip you linked for Win 64bit has the folder named "lix-V.0.9.22" instead of just "lix" so instead of just extracting and overwriting I had to manually merge after extracting. Don't know if this was intended, so I'm reporting it. Before that I just had to extract and overwrite. Thanks for the replays, Icho. The only severe backroute as far as I have seen is to "Past the Xmas Tree". "Trapped in Present Valley" is a substantial variant in one point but still acceptable. "Three Wise Visitors" is as well a substantial variant in one point, but very well acceptable, too. That solution has more style than the intended one. "Escaping the Present" is an interesting solution; it's about having different solutions. "Riding the Snowcat" is a neglible variant, generally the intended solution. I'm happy about the looks, too. Raymanni designed the Holiday set in 2017 and I've always wanted to show its quality. It mixes well even with the other drawing styles. Indeed, painting in Lix's finer physics resolution seems harder than in NeoLemmix, but I'm glad it's still possible. 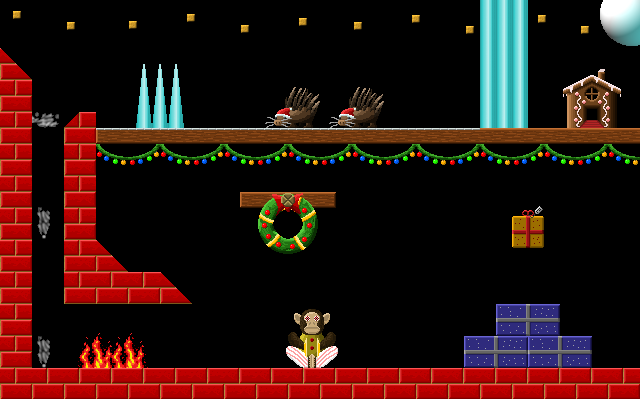 Right, the 1993/1994 Holiday Lemmings levels didn't allow hazards by tileset design. Those levels had a feeling of homeliness, we've tried to recapture that. When Forestidia showed me Advent Calendar, I immediately knew that this had to be among the preview images. But for long, it was sorted second among the 24 levels. Only very late in development, we sorted it first, where it really belongs -- the entire pack is an advent calendar after all. I've spent far more time than expected on xmas2018 and realized how much care is behind the maintenance of packs with ≥ 100 levels. Past the Xmas Tree: Icho's backroute will be fixed as follows: The diagonal wood to the right of the wreath will become thinner. Snow Cat Love: geoo found a backroute. We will remove the walkers from the intended route and change the level slightly to accomodate for no walkers. Decorate the Tree: geoo found a backroute. I'll have to design around this. Until then, you can play with an extra rule: You may not build at the porcupine. Precisely, you may not assign the builder in such a way that its bricks overlap any nontransparent pixels of the porcupine. Home Time for Santa: geoo found a backroute. We'll add steel below the monkey. Ride the Snow Cat should be ranked harder. geoo and Icho each solved the pack in ~3 hours, spending at most ~25 minutes per level. This is in line with our planning: We wanted no hard levels, many medium-difficulty levels, and some easy levels. This allows players to attempt one map per day and still have a fair chance to solve everything within schedule. I've now completed all of the levels. They were like delicious nuts: sometimes hard to crack but the good insides always paid off. I solved them all fairly easily, except 'Look Who Is Waiting up There'. I was stuck on that one for a good while but I did get it in the end. Every time I tried something I was always one skill short somewhere else. The skill distribution is great. I don't have a lot of experience with jumper puzzles, so that's why this gave me so much trouble. 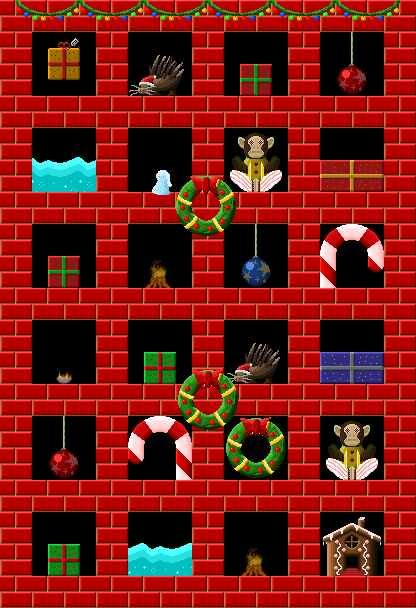 I really liked every level in this pack but some "honorable mentions" should be: 'Climb to Christmas', 'Docked at the North Pole', 'Stockpile of Presents' and of course 'Look Who Is Waiting up There'. Thanks! Happy to hear that the nuts gave you something to bite, and that you still solved them all. That's exactly what we had in mind! Interesting choice of highlights! Look Who is Waiting up There, it is tricky -- when I saw it first, I too questioned whether it was solvable at all. But I'm happy that it's all fair in the end.